Sorry if the title is a little confusing; this is a review of a new advertising service available online called ReviewMe. As a note, I am being paid to write up this review, but I can assure you, in my years of reviewing products, services, and software, I’m always up-front and comprehensive with my assessments. First, a little background on me and writing reviews. Over 7 years ago, I joined a gaming network, the Gamer’s Alliance Network, and while helping to run 3DGPU.com, I was approached to write reviews on the latest games. Due to the dot-com bubble, I was put out of work not too long into that job. I went on to review hardware for eUniverse, but that didn’t last long. I wrote reviews for 3DGPU for 5 years, on both hardware, and games. Now I currently use my blog as a vehicle for writing reviews, and so it is only fitting that I discover a service that will pay me to review services. 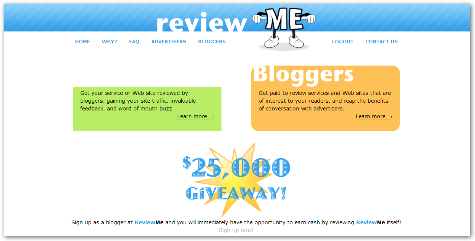 ReviewMe is an extension of Text Link Ads, an unobtrusive but effective advertising service that sticks to little text links to advertise. 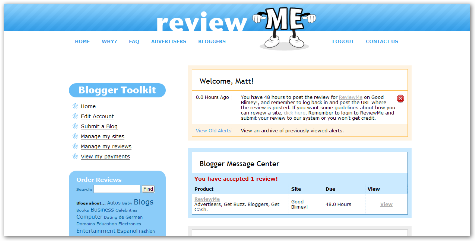 With ReviewMe, bloggers can express their opinions on websites and services. The review isn’t required to be positive, it can be negative, as long as you’re being honest — that’s the point of a review, after all. On top of that, unlike other services similar to ReviewMe, you are required to disclose that you are being paid for the review. 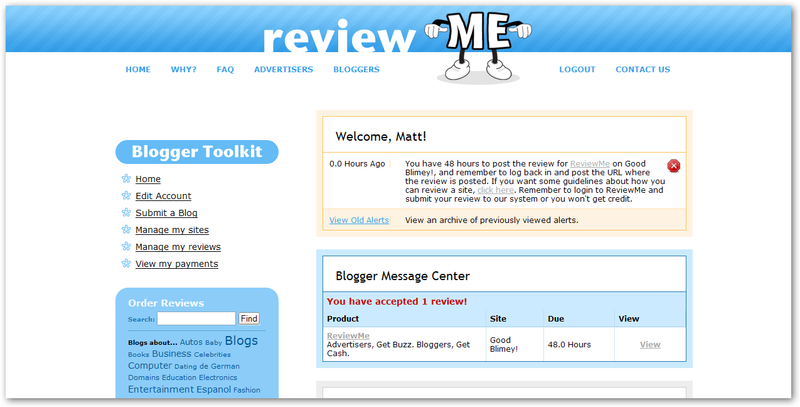 Working with ReviewMe, the design is pleasing and easy to use. Everything is bright and understandable. It has a decidely modern feel to it (some say Web 2.0, I say it feels good.) It’s a no-nonsense design that gets you the information you need, and allows you to work with the service, so you can write reviews, get paid, and everyone wins. As a nice little bonus, you can even subscribe to a RSS newsfeed that keeps you updated with anything that goes on with your account — especially handy if you have reviews on multiple blogs. The above image shows the account settings area for bloggers. If you’ve accepted a review, it will keep you informed of that, as well as give you a 48 hour time-limit once you’ve accepted to post the review and submit the URL to the review to them. Then you get paid your Payout price. Ratings of your blog for advertisers to see is comprised of multiple sources of information; your Alexa rank, Technorati details, and subscribers to your RSS feed. This ranking system is updated monthly, so your payout price can rise or fall, depending on the factors outlined above. Advertisers can browse for blogs by categories. Bloggers set their categories by tags, up to 6 for each blog. Then the advertiser can order based on that category they like. All in all, ReviewMe is a great idea, for it provides a human-driven feedback system that allows visitors to make informed decisions based on the review whether a website or service is worth their time, and in some cases, money. It allows the little guys to get seen, while providing bloggers an opportunity to write what they feel, and get a little grocery money on the side. For me personally, I’ve always been leery about using ads, most are too distracting to the visitors, and in most cases, never net me any funds anyway. 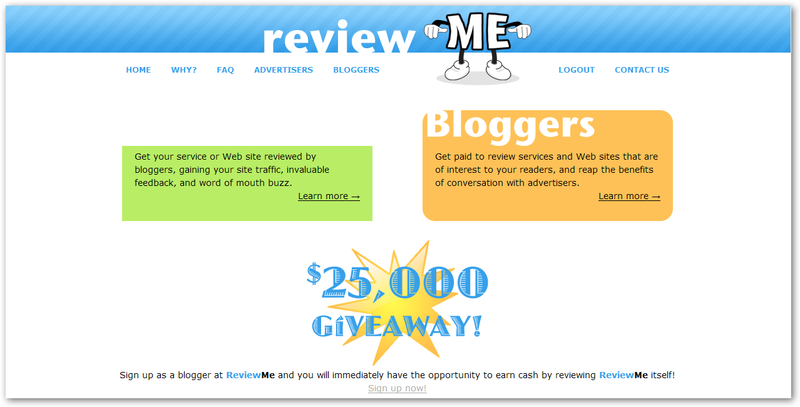 With ReviewMe, I get to put to use my review writing skills without worrying about obtrusive, meaningless ads.